Your Grand Canyon rafting trip begins in the lower 100 miles of the canyon. Here, the Colorado River's famous rapids, though still exciting, are a bit tamer. The scenery is astounding. Massive sandstone cliffs conjure up imaginary shapes. Hidden waterfalls and pools carve their way down to the river. Wildlife is abundant, with frequent sightings of elusive Blue Heron, soaring hawks and eagles, and majestic Big Horn sheep. At night, the canyon walls unveil a heaven of innumerable stars. To top it off, Western's Grand Canyon 3-day river trip offers easy access from Las Vegas, Nevada. Come join Western River Expeditions on an incredible and unforgettable Grand Canyon rafting journey. TRANSFERS Bus from river to Marriott Hotel in Las Vegas. This trip was to celebrate my 50th birthday, which it did in style. From start to finish the trip was brilliantly organized with fantastic food and terrific guides. A special thanks to Grace Tom Newman and JD who ensured it was a trip of a life time. We'll be back! A completely different experience than seeing the Grand Canyon from the top. This is participating in the game. This is the Grand Canyon fantasy camp. It’s complete relaxation. You’re not even thinking about any of the stresses back home. As you'll be rafting down the Grand Canyon for nearly 100 miles, the raft you ride becomes an integral part of your experience in terms of relaxation, whitewater, and ability to move about. While you'll certainly be getting on and off the raft quite a bit every day, your comfort on the raft is important. 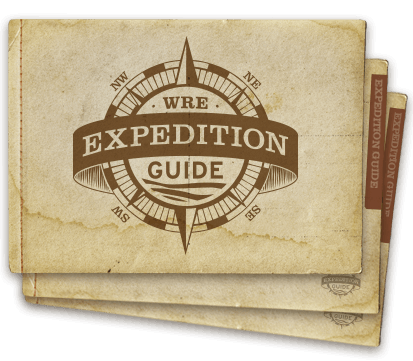 Western River Expeditions uses a patented raft called the "J-Rig." 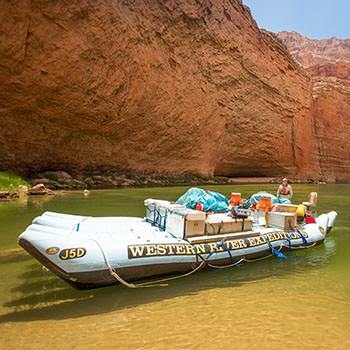 This raft offers one of the most comfortable rides on a Grand Canyon whitewater rafting trip. You'll find plenty of space to stretch out and relax in the calm sections of the river and one of the most exciting rides in the whitewater stretches. With plenty of seat positions to choose from, you can decide whether you'll ride up front for more action or further back for a calmer experience. On this Grand Canyon vacation, you'll spend 2 nights on the banks of the Colorado River. Professional river guides cook delicious meals for you and all the camping equipment you need is supplied. This is camping made easy. It was a dream come true! Sleeping under the stars in Grand Canyon was an experience that has no equal! The majesty of it all was overwhelming.